After writing last week about a pretty major 5 year anniversary – the discovery on Dec 28th 2004 of what is now called Haumea – it seems funny to be writing once again about a 5 year anniversary. But that’s just the way that reality worked. Eight days after discovering Haumea, and just a few days into the new year of 2005, I was back in my office again. 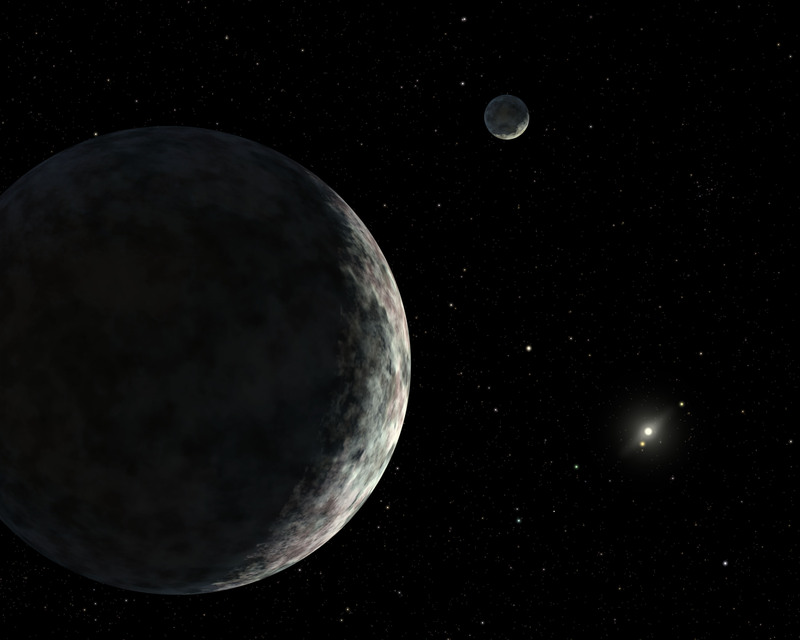 I wanted to be studying Haumea – or Santa, as we called it then – since I was certain that it had to be bigger than Pluto, but, sadly for me, we still didn’t have any new data on it. We only had those first three pictures and there was nothing new to learn. We were scheduled to get more data soon, but not soon enough for sooth my anxiousness. My fingernails were nubs. Trying to keep myself from going crazy, I spent my time searching through old images of the sky. These images were the ones I had been taking over the past few years to search for objects in the Kuiper belt, the same images in which we had already found Santa and also Sedna and Quaoar. I was re-looking through all of my old images to see if I had missed anything the first time around. I was particularly interested in things that were far away and thus moving very slowly. Since I was finding things by the fact that they moved, very slowly moving things were particularly hard to find. Often, things that I thought were slowly moving were actually just stationary stars that had shimmered a bit in one direction or another while I took my pictures, fooling me into thinking that they were really moving. Because it was so hard to find this slowly moving ones I had originally not tried at all. When I searched through all of my images the first time, no one had ever found anything further away than about 60 AU (about twice the distance of Neptune), so I thought, to be safe, I would set a limit of 90 AU. Beyond that I would give up and leave the discoveries for another astronomer. But in November 2003 I found Sedna, by the skin of my teeth, at 89 AU. It was so unexpected and so far away that for weeks I didn’t even believe it was real. We finally got confirming images on Thanksgiving Day. Sedna turned out to be, I still believe, the most important scientific discovery that came out of all of my searching of the outer solar system. Sure, finding things bigger than Pluto is cool, but it doesn’t fundamentally change the science of what is out there. Sedna in so many ways does. Nothing was supposed to be out there where Sedna was. And Sedna was even more strange. Rather than being far away but spending much of its time closer like, say, a comet would, it was far away and spent almost all of its time even further away. To this day Sedna’s origin remains a mystery. And the way to solve the mystery of Sedna is to find more like it. And the way to find more like it is to find things even further away. And, in 2004, the only way to find things further away was to slowly, tediously, go back through every single one of the images that I had already laboriously looked at and look once again to see if there might be something else there, moving so slowly that I missed it the first time around. I had spent 100s of hours doing this re-searching. It was mind numbing. But I knew that it was my only chance of finding something like Sedna, something else strange in the outer part of the solar system. So, on January 5th, 2005, really wishing I could be studying Haumea, I instead went about the tedious business of looking through old images once again. I finished all of the images from October 20st, 2003 and loaded up the images for the next night. I spent the usual tedious 20 or 30 minutes going through the first half of the images until I came to one that made me stop. On my screen was something moving – just barely – that was almost the brightest thing I had ever seen. In fact, only one moving thing had been brighter, and that had been Haumea itself, 8 days earlier. It was moving so slowly that I could tell that it was perhaps twice as far away as Haumea. And it was so bright that it had to be big. Very very big. I did a quick calculation on a scrap of paper sitting on my desk and realized that this thing was, without a doubt, bigger than Pluto. I make groundbreaking discoveries all the time. Really. Any good scientist does. And by now I know exactly how to react: assume I did something wrong and figure out what it was. Usually it only takes me a few minutes to realize I am totally, thoroughly mistaken. Sometimes I can hang on to that delusion of a big discovery for 10 or even 15 minutes. On occasion, I can even go for a few days before I realize what my dumb error was. This was 5 years ago. That was Eris. Eris is, beyond a doubt, real. That morning, while trying to kill time, waiting for the day when we might finally get some interesting data about Haumea, I had made the discovery that Discovery News called one of the top 10 science discoveries of the decade. On the evening of January 5th 2005, five years earlier than the evening that it currently is, I had secrets that only a few people knew. I had just found something bigger than Pluto. Diane was 3 months pregnant. The world was never going to be the same. I couldn’t wait. No doubt you have searched through all the photos looking for objects "out there". Is there some way that amateurs like myself can get access to these photos online to look for stuff that may have been missed? I know that one can do this with the Soho observatory. What about the observatory(s) you have used? Are the photso publicly available? Can we amateur sleuths go planet hunting too from the luxury of our desktops? Perhaps you could organise an amateur planet hunter's club to facilitate extra analysis and checking of the source data/photos in the hope of uncovering extra objects? Sedna turned out to be, I still believe, the most important scientific discovery that came out of all of my searching of the outer solar system. On risk of upsetting Eris on her "birthday" (and if we follow mythology, one should never upset Eris at any party) I must agree with you. However Eris was pretty cool too, specially for the turmoil it raised. As amateur passive receiver of such exciting news, I really miss those exciting years of expanding horizons. Though I'm pretty sure that not nearly as much as you do. Thanks to you and your team for a great work in any case. And sincerely, I wonder when will the trail of Sedna leads to yet another exciting discovery. I just hope it doesn't take as long as the trail of Pluto did. Eris was cool because it shook up our view of the solar system in ways not seen for generations. But, yes, I actually like Sedna more because it's weird little red world orbiting way, way out there. Congratulations Eris, on your birthday and to you, Professor Brown for keeping the outer solar system interesting. Your great discoveries so far are tied tightly to Lilah's natal planets. You need to look at 11Leo, 17Aquarius, and 10Pisces (best bet) to the gaps. Buzz on the Twitterverse is that knowledge of the discovery of 2003 UB313 (Eris) somehow was leaked immediately in early Jan. 2005 and that many more people knew about it than you or anyone else thought. Any suspicions about where the leak was? I believe I would chalk that up to people desperately trying to sound important by making up crazy stories! Thought it might be a rival team like the conflict over Haumea. If not, is it the 2012 crowd or maybe the astrologers? Stories about a "planet X" coming close to the Earth and causing disaster were widely circulated online years ago. "Doomsday" was supposed to happen in 2003 and many reported knowing about or seeing this supposed brown dwarf which in reality doesn't exist. When 2003 passed with nothing happening, all the "planet X" predictions then targeted 2012 as the "real" doomsday. Hi, just wanted to say I'm enjoying your blog- I've just found it whilst researching for my own (http://blogstronomy.blogspot.com/) and it's dragged me somewhat off-topic! Happy Birthday, Pluto! Don't let those whippersnapper KBO's ruin your retirement. Keep up the good work Professor Brown. Hello Mike, I realize this is an old thread so I apologize, (though I do miss the updates! I'm a big fan), but do you or anyone here know the best place(s) to get updates on surveys in the southern hemisphere, such as the one David Rabinowitz is conducting, etc.? I like your writing style too;.... It is the real deal. I am not from an astronomy background, but definitely from a data and discovery and "mining" / discovery and categorization background. It takes a lot of Model development .... After your Intuitions had been Formed first. During the supposed calling in the modeling stage... (both of the refinement of your intuitional areas of that model and in it/.... But also including the model itself, names, and characteristics or definitions of it... I assume it works like space too. ;) =]. are you still alive,...6 months no response? I know a brilliant philosopher and astronomer who contributed a lot in the field of astronomy and philosophy. He’s name was Guillermo Haro. Guillermo Haro was very famous, and at the same time, very influential in the development of astronomy in Mexico, not only because of his own astronomical research but also by helping in the promotion of the development of new institutions for astronomy. Moreover, he defined modern astrophysical research in Mexico where he paved the way to various initial lines of research and established general scientific policies. Too busy writing/preparing Your book leading to the events of IAU 2006 we suppose? We're looking forward to the book!